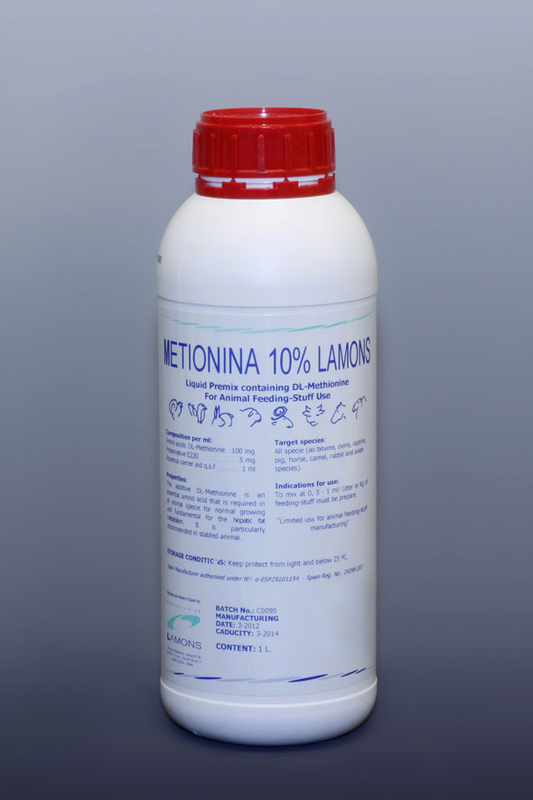 METIONINA Lamons is a complementary feed that provides DL-Methionine, an essential amino acid required by all animal species for an adequate growth and that is fundamental for hepatic metabolism. Especially recommended in housed or caged animals. When administering feed with a high content in fat. In general, in those cases in which hepatic intoxication, either chemical or foodborne, is suspected. For the prevention of the onset of the Fatty Liver Syndrome. Mix with a ratio of 0,5-1 mL/Litre of drinking water or per Kg of feed. The dose can be adjusted in quantity and time, according to the nutritionist or veterinarian's criteria, keeping in mind the animals' needs. ADMINISTRATION DURING GESTATION AND LACTATION: No contraindications have been described during these periods. INTERACTION WITH OTHER PRODUCTS: Alkaline product. Can interact with acid products, originating precipitates. Do not mix with other products without previously performing a stability test on the mixture. SPECIAL PRECAUTIONS FOR USE: Renew water daily. Do not administer in combination with acidifying products.